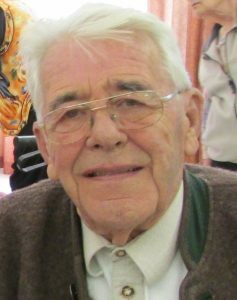 Goetz (Gus), 88, passed away on November 26, 2017 in Kamloops, B.C. after a short illness. Born in Munich, Germany September 15, 1929, Gus was predeceased by his loving wife, Rose Marie. He leaves behind daughters: Anne, Diane (Brian Sr.), Lea (Chris). Grandchildren: Marie (Toni), Greg (Lisa), Brian Jr. (Carly), Gerald, Brent (Lisa), Grant, Marissa, and Madison. Seven great grandchildren, Ted and relatives in Europe. Gus had a passion for travel and when he met Rose, they enjoyed many years travelling together with family and friends.